This two-week camp experience is situated in the Palestinian village of Beit Ummar and is a partnership project between the Palestine Solidarity Project (PSP) and Green Olive Tours (GOT). The Camp is hosted by Mousa Abu-Maria, his wife Bekka, founders of PSP, and Fred Schlomka from GOT. 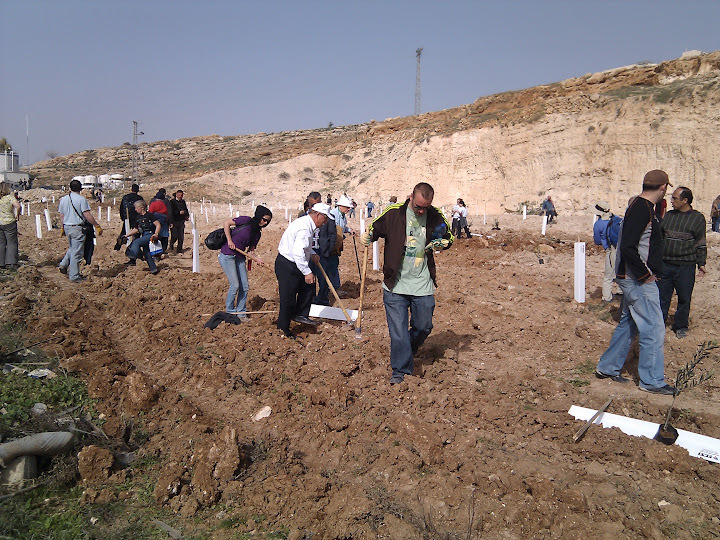 Beit Ummar is home to the PSP, a movement that conducts non-violent resistance activities against the settlements and the Occupation. Green Olive Tours is a tour agency that specializes in political and cultural tours in Palestine and Israel, visiting historic sights, providing people-to-people contacts, and critical analysis based on democratic values and human rights. The community of Beit Ummar is nestled in the hills south of Bethlehem and surrounded by a pastoral environment of olive groves and fields. The villagers have lost a great deal of land to the surrounding Israeli settlements, and the local economy is devastated due to the restrictions of the Occupation. The camp is designed to enable international visitors to express solidarity with the villagers, and provide tangible assistance through a variety of activities within the community. In addition there will be briefings, meeting with families, tours of the West Bank, and opportunities to participate in non-violent civic actions against the Occupation. Many of the evenings will include featured Palestinian and Israeli speakers and discussion. Wireless internet is available at the PSP office. Community work will include building a greenhouse, repairing olive grove terraces, fruit picking, activities with youth, and tutoring in English. There is also a woman's embroidery project which is available for participation by women only. Day 1 - Monday July 19th - 09.00am meet Fred at the Pickup point in Jerusalem and transfer to Beit Ummar. Meet Mousa and your local hosts and settle into the camp. There will be a briefing with maps of the area and the schedule for the two weeks will be reviewed. Walking tour of the village. Day 4 - Thursday July 22nd - Tour of the Southern West Bank with your host Mousa, visiting villagers under siege by settlers. Hebron, see the settlers living on top of Palestinian residents, the Ibrihimi Mosque, and the Old City. Visit a local family. The situation in the south is particularly acute since the settlers in that area act with impunity against the local Palestinians. Day 6 - Saturday July 24th - Non-violent action against the Occupation (optional), led by the PSP and the villagers of Beit Ummar, with participation of Israeli activists.. Typical actions include a sit down blockade of settlement access roads, or cultivation of lands adjacent to a settlement which have been declared off-limits by the Israeli authorities. These actions are conducted in the best traditions of Ghandi and Martin Luther King. However on occasion the Israeli police and military break up the demonstration and tear gas may be used. Campers not wishing to participate in the civic action will be offered alternative activities in the village. Day 7 - Sunday July 25th - Free Day. Spend a day of reflection at the camp, in the olive groves or strolling the village. A shuttle will be available for campers wishing to spend the day in Bethlehem. Day 8 - Monday July 26th - Tour to Jerusalem with Fred who will provide critical analysis of the situation in and around Jerusalem. Briefing with maps. Walking Tour of the Old City. See the settler homes and develop an understanding of the strategies of the settler organizations that are trying to thwart any possibility of sharing Jerusalem with a Palestinian State. Then back on the bus for a tour of Greater Jerusalem. Visit Palestinian neighborhoods and Jewish settlements. See sections of the Separation Wall, checkpoints, and the segregated roads being built by Israel. Day 10 - Wednesday July 28th - Tour to Nablus and the Northern West Bank. Visit the Samaritan village on Mount Grizim, Balata Refugee Camp, Jacob's Well, and the Old City of Nablus. Visit a traditional olive oil soap factory, and a Turkish bath. Day 13 - Saturday July 31st - Community work (half day). Help wrap up the camp and visit the people with whom you have established relationships. Gala farewell dinner with all the people you have met during the camp. Day 14 - Sunday August 1st - Transfer to Jerusalem. Campers will be in large tents with a field kitchen. Everyone will be expected to participate in food preparation and maintaining the camp. Sleeping arrangements will be separate for men and women out of respect for the local culture. No alcohol is allowed in the village. Campers are requested to maintain modest dress at all times. The weather will be hot so loose fitting shirts, dresses or pants (trousers) are best. Shirts and tops should cover the shoulders and upper arms, and fit close to the neck. and no shorts for men or women. Respecting local dress codes will enable you to better develop relationships with villagers.